We pride ourselves on quick turn-around and excellent quality. Planning your wedding should be stress-free, and we are here to make that a priority as you select all the stationery items for your wedding - from the save the dates to the wedding invitations to the table numbers and favors at your wedding reception. Arrival of your order is based upon the estimated shipping date plus the shipping method you choose. In order to ensure your items arrive in time for your event, please use the following delivery calculation charts to determine the estimated date you'll receive your order. We offer Free Ground Shipping Everyday on Orders $100+. Use promo code SHIP4FREE at Checkout. Only one promo code may be used per transaction. Free shipping applies to US Customers only. Also Note: Base shipping charges are subject to change. We do offer an everyday offer of Free Ground Shipping within the U.S. for all orders over $100. Only 1 promotion code may be used per order. 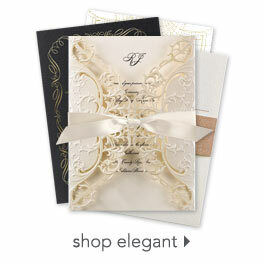 Invitations and other printed materials are generally printed, packed and shipped within 2-3 business days. Please allow 2-6 additional days for delivery based on your chosen shipping method. Some accessories ship from third party locations and may require additional production time. Please check your individual item for an estimated ship window. *Estimated shipping will also be provided for you in the checkout. Orders are processed and shipped during regular business hours (Monday through Friday 8:00 AM - 5:00 PM EST, excluding holidays). To ensure the fastest and smoothest possible delivery, taxes, customs fees and import duties are included in your shipping costs when UPS is chosen as the shipping method. We recommend this method of shipment for best tracking. Please note: we do not ship C.O.D. to Canada. We do not ship to P.O. boxes in Canada.